Guided Re-Record functionality allows you to recreate steps from an original document into a new document, as well as capture translated screen images and graphics. When you open an existing document and select to Re-Record, a guide pane opens in the recorder preview pane to display the guide steps. Use the guide steps to help you recreate the required actions in the target language. Review Capturing Controls in the Target Application for an overview of recorder capabilities, limitations, and the steps you must take to capture specific objects. Review recording preparation guidelines and recorder options as specified in Specify Document and Simulation Editor Options. Select the desired language(s) for Re-Record within the template as specified in Specifying General Settings: Languages. Ensure the desired target languages are installed in the application to be recorded. Use the pause feature if you must take a break. Stopping the re-recording will end the session. Do not move action notes; simply perform the action as guided. If you think you will need to adjust the position before re-recording, perform the adjustment in the original source document before you start the re-recording session. Ensure you are re-recording with the same screen resolution as the original content. 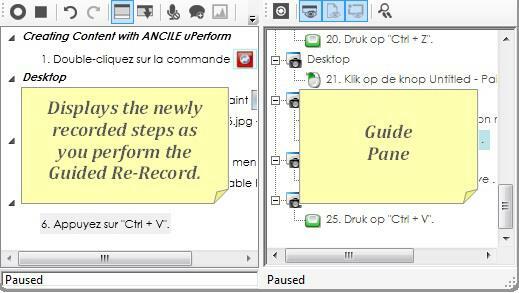 Add any additional information to the resulting document via the Insert > Steps functionality in the Editor; however, if you need to pause the recorder to record additional steps into a document based on a language-related change in process, ensure you resume the guided re-record functionality before continuing. Do not resize or move windows during a session. Perform only the actions necessary to perform the tasks being documented.